Flint knives are believed to be among the first cutting tools the human race invented. They were made of sharp rocks and were very effective for the household uses. 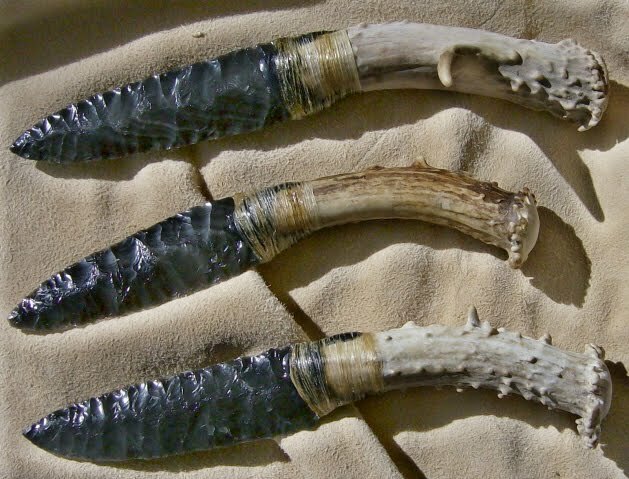 Well, with stainless steel knives these days, making flint knives is nothing more than a fun-filled hobby or to make some arty crafts for decoration. Making flint knives may take a lot of your time but you won’t need any specialized tools for this purpose to perform the job. Just few simple household tools can be used to make your own flint knives at home. Find a flat piece of flint rock and a chipping tool to begin the process. Strike the flint rock with the chipping tool at an angle so that the blows are the glancing ones close to the edges of the rock. This will convert the edge of the rock into the initial shape of the flint knife. The length of the blade should be about six inches and make sure it is not very thick, as thicker blade won’t be effective in cutting properly. You have to keep striking the blade with the chipping tool until it gets thin like a utility knife edge. As for making the handle of the flint knife, chip off the parts of the flint from the bottom three inches and make it narrower than the blade. Don’t make glancing strikes at the handle to make it sharper at the edges but try to keep it round. You will need to wrap up leather at the handle of your flint knife later and sharp edges might cut the leather. Once you have chipped the flint stone into the desired shape, you need to sharpen the blade with your pointed sharpening tool. Simply press the sharpening tool against the blade of the knife and drive it outwards. This will chip off tiny bits from the flint stone and make it sharp as a knife. Keep working on the entire blade and when you see it is sharpened enough, start applying the same technique on the opposite side of the knife. This process is quite slow one and will require your patience to complete. Take a piece of leather and wrap it around the handle of the knife. Secure the leather with tying its strips at the bottom of the handle so that the knot does not irritate your palm while holding the knife.